For the salsa we finely diced one red pepper, finely sliced two spring onions and a finely chopped red chilli (or two). Combine these together. Next, toast a handful of sunflower seeds in a dry frying pan for 5-10 minutes, tossing them occasionally and taking care not to burn them. When they’ve started to turn golden take them off the heat and splash some soy sauce over them. They’ll become slightly sticky. Leave to cool and then stir into the salsa. Finally roughly chop a handful of coriander leaves and add to the salsa. The soup is something of a fusion of West and East but the ingredients complement each other perfectly and are often found together in varying combinations around the world. The kale could be Savoy cabbage, cavolo nero, spring greens, spinach or even pak choi. 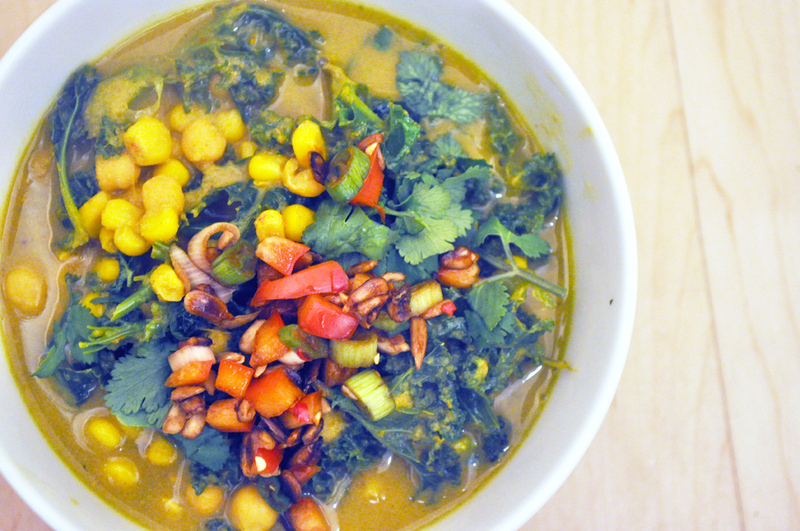 We had some kale left, so that’s what went in the pot – and it’s great with chickpeas. First, make a ‘curry’ paste: grate a 1-inch piece of ginger, finely slice three cloves of garlic and three medium shallotts. Finely slice two green chillies (strength to your licking) and two sticks of fresh lemongrass. Place all these ingredients in the jug of a food processor/blender. Now add 2 teaspoons each of ground cumin and ground turmeric. Add half a cup of water and blend to get a smooth, thick sauce. Heat a large saucepan, add a dash of sesame oil and add the curry sauce, cooking it for five minutes – you should smell the aromas. Then add a medium-sized tin of sweetcorn kernels, a tin of chickpeas and a tin of coconut milk. Stir. Then add 600ml of vegetable stock and bring to the boil. Simmer for 15 minutes or so then add some handfuls of roughly chopped greens. Cook for 5 minutes more if you’re using soft greens (spinach etc) or 10 minutes if you’re using tougher cabbage or kale etc. Check the seasoning and serve, topping the bowl with a good spoonful of salsa and a squeeze of lime. Where to begin with satay sauce? I reckon it’s best to imagine it as an Asian sweet chilli sauce with the addition of peanuts. That’s essentially how we make it, in any case. Some people simply add a dollop of peanut butter for that sweet peanut flavour, but we grind skinned peanuts, coarsely in a food processor and then soften them by simmering in a little water for 15 minutes until they’re almost creamy. For the chilli sauce I made what is becoming our ‘standard’ base, which can be adapted for many Indian curries and Chinese/Indonesian/Malaysian recipes. Essentially, for sauce for two people, you take a couple of medium shallots, two cloves of garlic and some chillis (to your liking!). Add a little oil and a dash of water if you need and blitz in the small jug of a food processor until you have a paste. Spoon into a dry frying pan and ‘cook it off’ for about 10 minutes. I added a splash of soy sauce and of Chinese rice wine vinegar near the end of the chilli sauce cooking. Then add the simmered peanuts, et voila. 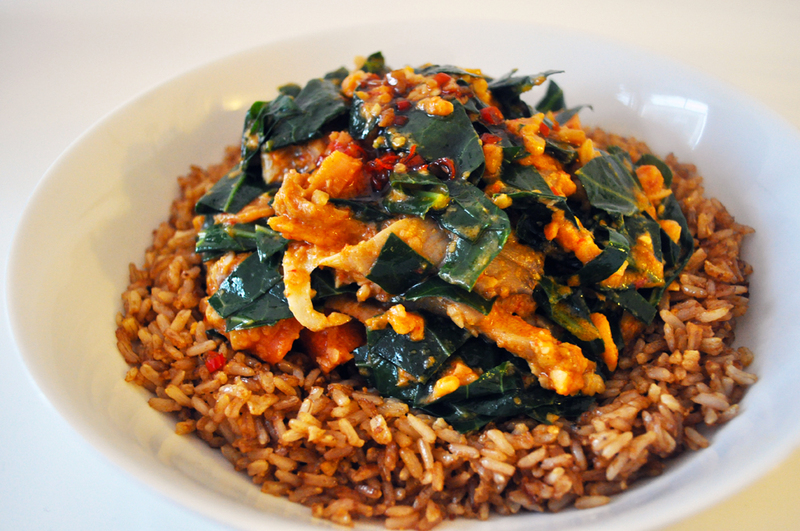 The rest of the dish is basically stir-fried greens – and almost any would do – plus a little assortment of veg. I had some spring greens to hand, so they went in the wok, along with some oyster mushrooms and some shavings of carrot. Once it’s sizzling, piou over the satay sauce and heat through for a few minutes. Serve on egg fried rice. Never fry rice if it’s still steaming and hot. Allow boiled long-grain rice to cool completely before letting it even look at a frying pan. Once cool, heat a little sunflower and a tiny bit of sesame oil a wide frying pan and add the boiled rice. Once it’s crackling and hot, add a little soy sauce. Make sure the soy is evenly distributed through the rice and cook for 5 minutes. The crack an egg per person into the rice, stir quickly and cook for another 10 minutes, making sure the egg cooks through, dries out somewhat, and becomes mostly broken apart.